What is WrestleMania Without The Undertaker? As we continue on the road to WrestleMania 31 we have seen the buildup of many feuds, but there seems to be one thing missing. We are well on our way and still there has been no direct sign of The Undertaker. The Deadman has left a legacy of returning somewhere in the month of February to start giving us a sense of his darkness. But this year, so much as his name hasn’t even been mentioned yet. We all know about the match that was supposed to happen, but let’s focus on that match the looks like it is going to happen instead. In what would be an intriguing battle of two sadistic minds, the WWE seems to be leaning towards Bray Wyatt vs. The Undertaker in a match that is based on a war of darkness and evil. In a confrontation that would include a ton of compelling promo work, it would be interesting to see if Taker would pass the torch to Bray, who many see as The Phenom of the modern day. 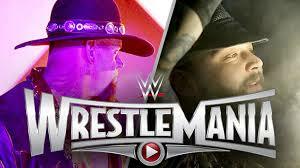 Bray Wyatt could be the perfect opponent for The Undertaker and the WWE universe as a whole. He is an up and coming superstar who already captivates the audience with his words and in-ring ability. There are many scenarios that could play out in this match, but either way it could prove to be electric. One vision in my mind is making this somewhat of a gimmick match, leaving us all clamoring around to wonder what will happen next. My vision is based on the fact that the streak is over, so what else is there to build on? What if The Undertaker brought back some of his sadistic Ministry of Darkness promos to go against Bray Wyatt’s Sister of Abigail flirtations? There is also a rumor of the “Urn” coming out of retirement and making its presence felt in a big way. If this is the case, another segment of this story could have a Wyatt Family Reunion brewing, herein forcing Kane to come to the aid of his brother and protect the history of the ashes in the process. Either way, the supernatural psychology between Bray Wyatt and The Undertaker could build an intense feud going into WrestleMania, making for some very interesting television. Obviously, anything could happen, but the constant talk behind the scenes and the promos that keep arising are definitely pointing us into this direction. Bray Wyatt made his feelings felt with another cryptic promo on last week’s episode of “Monday Night Raw” and it sure seems like he is talking about The Undertaker. Look below and judge for yourself. Whether Taker comes back at all is another issue. We are well aware of the pictures surfacing throughout the year, especially the one in an airport where the effects of devastation he suffered at last year’s event could be clearly seen. His legacy will remain as one of, if not the greatest Wrestlemania performer in the history of the WWE if he doesn’t return. The fact remains that he is 49 years old and his streak is broken. What has he got left to fight for? Will he sacrifice his body for another match? If so, will his body hold up? Next Next post: Marcus Mariota vs. Nick Foles: What Deal Does Philly Do?